Following an announcement made by Strathclyde Partnership for Transport in January that in order to save some £430,000 per annum, they would be withdrawing the heavily subsidised Renfrew-Yoker ferry service, various proposals for continuation of the cross-river link have been put forward, including an amphibious bus service. On Friday, two companies were shortlisted to provide a service, Rosneath-based Silvers Marine, and Inverness-based Clyde River Taxis. 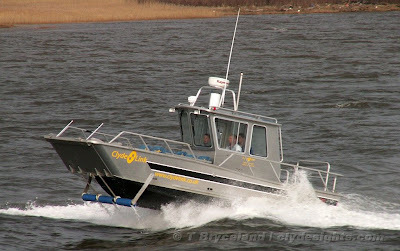 This craft, belonging to Silvers subsidiary company Clydelink, set up to operate the service, was seen returning downriver after having performed trials on the 200-yard wide crossing.